SUPERIOR DRYWALL, INC. was founded in 1979 by the current owner Mike Myers, and the late Jim Kellogg. This company has employed from 40 to 60 employees & subcontractors at one time, and served nearly a hundred local contractors. Honesty • Workmanship • Experience • Accessibility • Reliability . . . Within our service & supervisory staff alone you are served by over 2 centuries of drywall experience. No other residential drywall contractors on the Eastern Shore place such a wealth of experience at your disposal. 1. CONFIDENCE: From our inception we have endeavored to bring the highest level of professionalism and service to our customers, making us the most trusted name in our industry. 2. 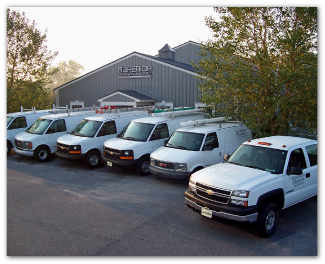 SERVICE: WE ARE unique in maintaining a full time crew of professionals dedicated to - and proficient at - the small jobs and repairs many contractors will not perform. 3. COMMUNICATION: Our company maintains a full time office, with supervisors and service personnel who are accessible by cell phone, so that communication is available to you, our customer, at all times. 4. EXPERTISE: Superior Drywall, Inc. offers some of the most skilled craftsmen in their respective fields to perform your job with a minimum of inconvenience to you. 5. STATE OF THE ART MATERIALS: As proactive drywall contractors, Superior Drywall, Inc. is always alert to new and improved product. When we find one that enhances the quality of your job, we use it. 6. OUR WARRANTY: Superior Drywall, Inc. has established a track record of handling warranty issues promptly - which is more important now that lumber quality has declined. 7. VERSATILITY: Whether your drywall needs may be for custom trim or accessories, a special wall or ceiling texture, water damage or settlement repair, even historic restoration, our personnel has the experience and expertise to meet the need. 8. CONVENIENCE: You have enough to do. From your FREE Estimate to the delivery of materials, to the final cleanup, we handle everything for you. You can even pay by VISA or MasterCard. It is best represented by the integration of high quality, excellent service, and a fair price. These are the factors that make Superior Drywall, Inc. YOUR BEST VALUE.